China’s nightly official newscast, Xinwen Lianbo, is not generally the kind of programming that gets the blood flowing. Its regurgitation of the political news of the day is a political ritual, more about the Chinese Communist Party’s construction of power than about relevance to television viewers. 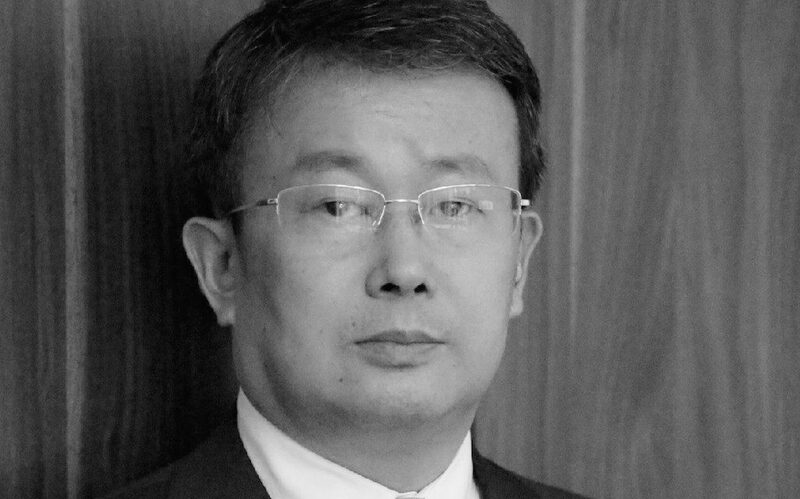 But when Xiang Ligang (项立刚), chief executive of the telecom industry news site cctime.com, remarked on social media over the weekend that “those who don’t watch Xinwen Lianbo are generally low-quality people,” things got very heated indeed. Many internet users, infuriated by the apparent political-class implications of Xiang’s remarks and his supercilious toadying to the Party, leapt to the attack. Where did Xiang get off deciding who was “low-quality” and who was “high-quality”? 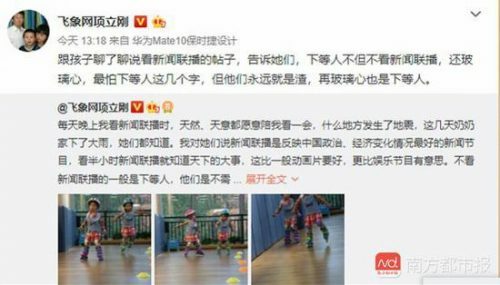 The tiny spark of Xiang Ligang’s phrase “low-quality people,” or xiadengren (下等人), caused such an online conflagration that even China’s commercial media pitched in on the story. The following is a short interview Xiang did with Guangzhou’s Southern Metropolis Daily. SMD: why did you send out the Weibo post with the phrase, “Those who don’t watch Xinwen Lianbo are generally low-quality.”? Xiang Ligang: It started when I noticed that in the Taiwanese news, aside from some political discussion programs and some entertainment programs, there wasn’t much in the way of content, compared to a science and technology program I’d seen on CCTV-2 that had a lot more value. So I posted an said that. SMD: How do you view the way things have developed and been communicated? Xiang Ligang: I never thought this thing would escalate to the point it has. It’s definitely been played up by just a few people. And I don’t really want to waste my time on this matter. This was just my own personal attitude, something I shared within a small group. And most of my fans are those who pretty much share my outlook on things. But later certain Big V’s started started pushing this and seized on that phrase, “Those who don’t watch Xinwen Lianbo are generally low-quality,” so things really spread like wildfire. These people, you could say, have values really opposed to mine, and they seized on this phrase to launch an attack against me. SMD: What did you mean when you said “low-quality people” in your post? Xiang Ligang: I have a very clear definition about low-quality people. In my eyes, high-quality people are first and foremost those who do real things. People who have ideals and who take things on. People who face life with courage and strive for self-improvement. And finally, people who love themselves, love their family, love their hometown, and love their country. It’s not at all how it was made out online, just referring to people who have money and are living well. Who are low-quality people? People that are lazy and greedy, who are ungrateful, who don’t take responsibility — they harbor dissatisfaction and hatred toward society. SMD: How do you view the critical responses online? Xiang Ligang: I’m essentially a conservative. I believe that right now social stability and economic development are good. This is my basic outlook on life. So why are many people attacking me? Some ordinary internet users are just seeing that one line and feeling it’s totally unacceptable, and I can understand why they are upset. I think its normal for them to attack me. Then there’s another group of people who know what my values are and who just despise me. Later a bunch of people told me that they despise me because I support the idea of patriotism. These people, in my view, are low-quality people. This kind of person really rubs me the wrong way. This is just my attitude in life. These people don’t have an effect on me. I just go about my own business. I don’t rely in this life on Weibo, or on seeking conflict.